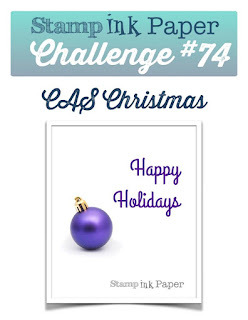 Tina's Crop Shop: SIP Challenge #74 - CAS Christmas! Hello and Happy Tuesday! Hope you are having a wonderful week so far! I am super duper excited about this week's Stamp, Ink, Paper Challenge! For some reason, I am really getting in the Christmas Spirit and this week's challenge is a Clean & Simple Christmas Card! This burst of Holiday spirit may be because I spent Friday night with my friend, Polly, making Christmas cards! I believe I will actually have all of my cards made early this year! Well if you know me, you'll know that Clean and Simple is not my usual style but I really thought it would be fun to use one of the stamps from the Cookie-Cutter Christmas bundle so that's what I did! I started with an 11" x 4 1/4" piece of Real Red Cardstock that was scored at 5 1/2" for a top fold card base. On a piece of 4" x 5 1/4" Whisper White, I stamped one of the splatter stamps from Gorgeous Grunge in Crumb Cake Ink. I found a piece of White and Red Washi tape in my stash that I adhered to another strip of Whisper White and then glued onto the splatter stamped portion of my white layer with Tombow Multipurpose Glue. I then made several loops of the Red Metallic Thread from the Holiday Catalog and adhered it with a mini glue dot. I stamped my Gingerbread Man from the Cookie-Cutter Christmas set in Soft Suede onto Crumb Cake Cardstock and punched him out. 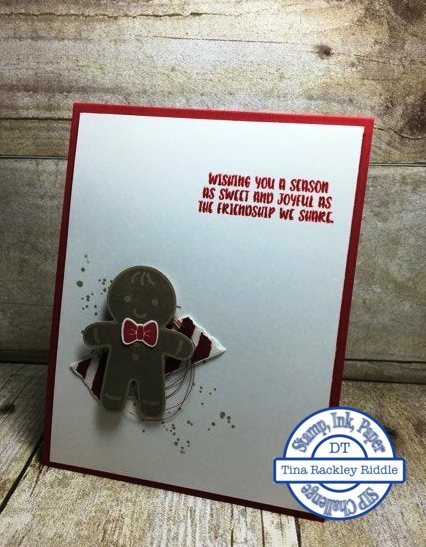 Next the bow was stamped in Real Red onto a small scrap of Whisper White Cardstock and punched out and then adhered to the Gingerbread Man with a Dot of Tombow glue. 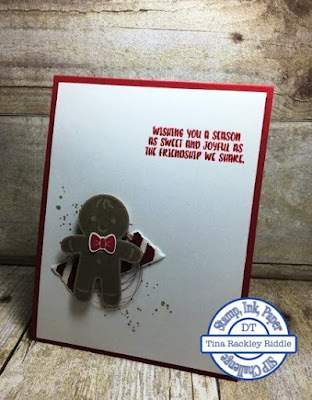 I adhered the Gingerbread man onto the Thread and Washi Tape with Stampin' Dimensionals. I inked the sentiment up in Versamark Ink, and then in Real Red Ink and then clear embossed it with my heat tool. Although this is not my typical style, I think it is super cute! I hope you do too!